Ebola Screening At JFK Airport Flagged 91 Travelers; None Had Virus : The Two-Way In the wake of the first case of Ebola being contracted in the U.S., CDC director Dr. Tom Frieden discusses plans to stop the disease and apologizes for an implication some saw in his remarks Sunday. A plane arrives at New York's John F. Kennedy International Airport. Since Ebola screenings began Saturday, none of the 91 passengers identified as having an increased risk of an Ebola infection was found to be sick, the CDC says. 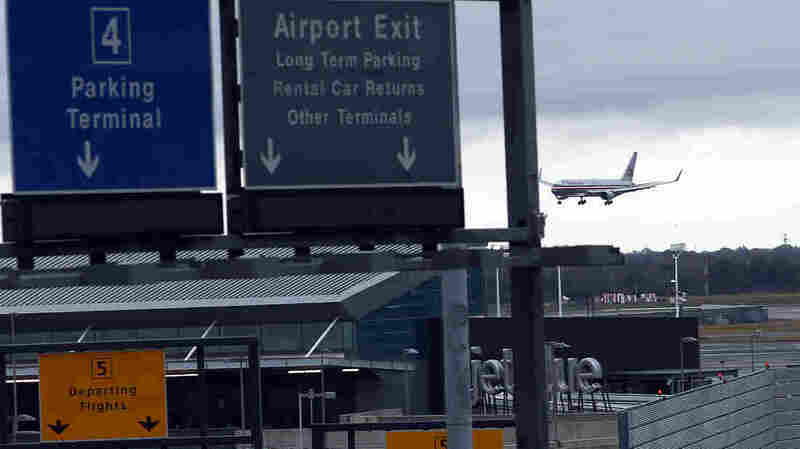 Newly instituted screening procedures at New York's JFK International Airport identified 91 arriving passengers as having a higher risk of being infected with Ebola based on their recent travel, CDC director Dr. Tom Frieden said Monday. None of the airline passengers had a fever, Frieden said, noting that of five people who were sent for further evaluation, none were determined to have Ebola. Frieden spoke at a news conference in which he gave an update on the effort to "break the chain of transmission" of Ebola; over the weekend, his agency confirmed that a female health care worker at Texas Health Presbyterian Hospital in Dallas contracted the virus while treating Thomas Eric Duncan, who died last week. In the wake of the first instance of Ebola being contracted in the U.S., Frieden said the airport screenings at JFK are part of the agency's plan to stop the disease; he said screenings will be instituted at four other airports — in Atlanta; Chicago; Newark, N.J.; and Dulles, Va. — by Thursday. Health officials are analyzing safety protocols to prevent further transmission of the deadly virus, with Frieden saying they are open to "anything that could make it safer and easier" for medical workers. The CDC chief also said he hadn't intended to imply he was finding fault with the new patient or the Dallas hospital when he repeatedly discussed a "breach of protocol" Sunday — a characterization that drew some complaints. The National Nurses United union's Bonnie Castillo, who leads its emergency response unit, told Reuters,"You don't scapegoat and blame when you have a disease outbreak." The union has previously complained that not enough has been done to train health workers in how to treat a potential Ebola patient, as The Hill reports. "I feel awful that a health care worker became infected" while treating an Ebola patient, Frieden said today. He said that any hospital in the U.S. should watch for the possibility of an Ebola case, particularly if staff observe someone with a high temperature who has been to the three West African countries that are at the center of the outbreak: Liberia, Sierra Leone and Guinea. He later said that the "single most important thing" for hospital workers to do is to take down a history of a patient's travel in the past 21 days. Noting that officials are concerned that more cases might emerge in the coming days, Frieden said the CDC is taking steps to decrease that risk, saying the agency is conducting training and outreach to help health care workers avoid becoming infected. And in the Dallas hospital where the new patient is being treated, staff members are now assigned to watch their colleagues as they emerge from an isolation unit and remove their protective gear. Frieden also said officials are considering increasing the practice of spraying workers down to rid their gear of any potential infection sources. Speaking by phone from Texas, state health department commissioner Dr. David Lakey said the new patient's apartment has been cleaned of any possible contamination. Photos from the scene showed a trailer full of barrels being hauled away from the woman's apartment. Lakey added that officials are looking for somewhere to house the woman's dog.